The past few days, I haven't really been doing that much work, so I've had this little biting feeling that I needed to make the most of my current time by boosting my productivity. However, I was also hit with a slump, completely ruminating over something that I couldn't possibly fix. Whenever I opened up my blog, I just couldn't do anything, because my mind wasn't into it, it was focused on something else. I think that the thing about self-love is that there is a thin line between taking some time off for your own mental health and taking some time off just because you don't feel like doing anything. The main counter-argument against taking mental health days is that it's just being lazy and is not a sufficient enough excuse to take the day off. However, mental health days can be extremely effective, as they allow you to recharge so that you can be even more productive in the future, can help you to feel better and happier, and can benefit your health, that is, your mental health, which is just as important as physical health. However, while I highly believe that mental health days can be miracles to your well-being, I do understand how it could potentially be a slippery slope, which is why some people are wary of them. 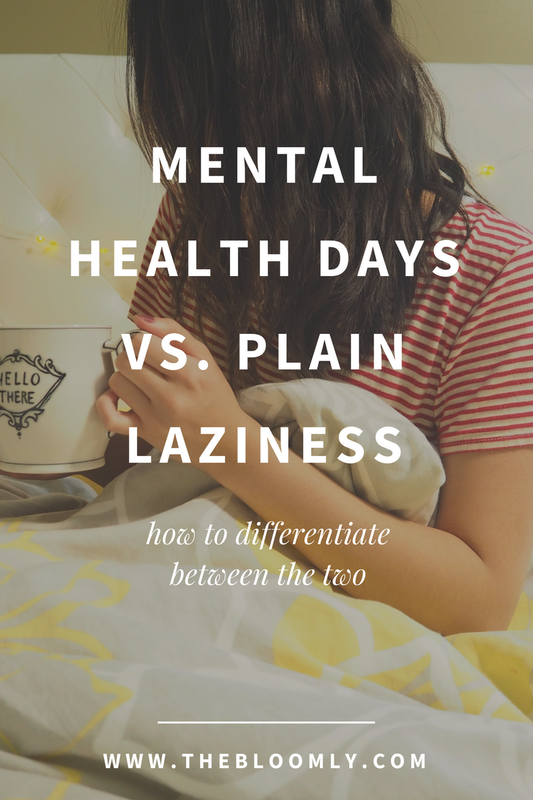 That's why I believe that it's important to be able to know and understand the differences between taking a mental health day and just taking the day off because you're lazy. By doing so, you can be more sure that your mental health day is truly a mental health day, without the added guilt of "what if I'm just being lazy". So here's how to differentiate between the two. Mental health days are planned. A mental health day should be something that you plan around your schedule in order to ensure that you get that recharge time, but that recharge time doesn't conflict with any important meetings/events/responsibilities. This means that you consider when you can take the day off that won't be work-heavy. Maybe you have an exam on Tuesday, so don't pick Tuesday to take the day off. Maybe pick Wednesday, when you have a light schedule. Mental health days aren't excuses to skip a work-heavy day, but carefully planned days in order to recharge while still being able to attend to your responsibilities. 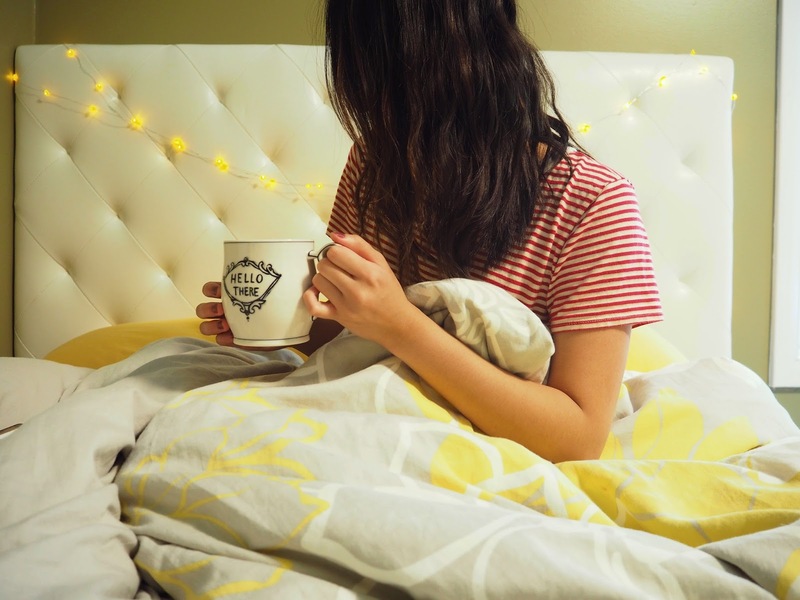 Mental health days are planned in order to get the positive benefits of recharging without restricting any of your other responsibilities, whereas being just plain lazy means that you don't consider the ramifications, just picking any day to take off that you feel like not showing up for, maybe even avoiding some of your big responsibilities by taking the day off. Mental health days are taken when you feel intense anxiety, but taking a lazy day is taken for the opposite reason. When I'm lazy, I have absolutely unwilling to put in effort into anything, even things that might have fast-approaching deadlines. Somehow, I'm completely at ease, even though there are probably a million things that I should be thinking about. However, on the other hand, when you need to take a mental health day, you might be feeling intense stress and/or anxiety about everything, even the things that are far in advance and you probably don't need to worry about yet. Mental health days are for when you're losing sight of yourself. When you take a mental health day, you're trying to grab onto feeling like yourself again, maybe that means through doing activities that you usually love and haven't really been feeling lately or by sitting down and engaging in some mindfulness. On the other hand, when you're just being lazy, there's no reason to be taking the day off, there's no purpose for it. Mental health days have the purpose of recharging you so that you can feel like yourself again. Mental health days are purposeful. Laziness is not. Mental health days are for when you are losing sleep to the point of poor performance. Often, we take mental health days to catch up on some sleep. However, what seems "lazy" about that is that you're spending more time in bed rather than actually getting things done. However, the thing about sleeping during your mental health day is that you're catching up on that sleep that you had been losing for days. Let's say every day during the week, you've been coming in, totally sleep-deprived, to the point that you could not focus and produced poor work. By having that day to recharge and catch some Zs, you are able to come back and give your best efforts into your work. However, being lazy just means spending extra time in bed, just because you don't want to put any effort into work. A mental health day of sleep is an investment for your future productivity while being lazy and sleeping the days away for no reason is the refusal of productivity. So what's the main difference? Based on what I've mentioned, the main difference between mental health days and laziness is that laziness is just not doing anything for the sake of not doing anything. However, mental health days have a purpose. Mental health days have reasons for needing them (ex: poor performance, anxiety, irritability, unhappiness, etc.) while also using them to better future work. Therefore, mental health days are pay-offs that will better enhance our endeavors, while being lazy has virtually no effects on work ethic. Thanks Rebccca for taking about Mental Health Day. I told that you are a great blogger. I have read your post very carefully. I want to know about personal statement writing service. can you help me?